Nature lovers, surfers, and adventure seekers who want nice ambiance and beach access. The Gilded Iguana has been a staple of the surfing scene in Nosara since 1988. With excellent service and modern accommodations, the hotel is only five minutes away from one of the most famous beaches in the area, Guiones Beach. Enjoy a beautiful location, commune with nature, and experience an authentic surf hotel in Costa Rica. Surfing. Whether you are a pro or beginner, this hotel is optimal for surfers. Family ambiance. With a kiddie pool and menu, The Gilded Iguana is good for the whole family. Beach access. The hotel is within walking distance of the beach across an unpaved path. Complete isolation. The hotel is in a bustling if small surf town, so others are a common sight. Extreme luxury. Rooms are modern and well-appointed but don’t display any excesses to help you unwind. If you love the beach, The Gilded Iguana shares that passion with you. 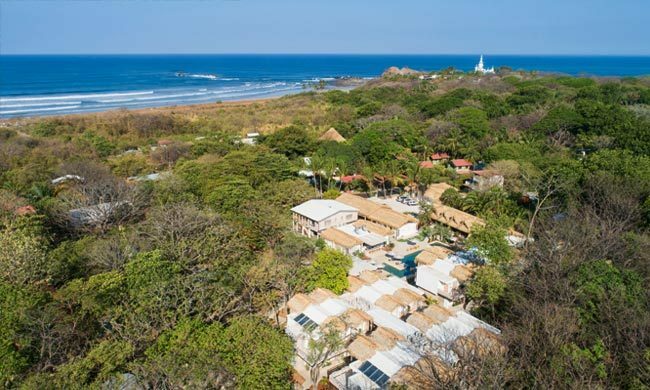 Located in the famously beautiful Nosara area, in Guanacaste, this hotel is 2.5 hours from the Liberia International Airport. It’s also a short walk away from Guiones beach, a famous surfing spot in the area. Positioned between this beach and the rainforest from a protected area, The Gilded Iguana is the perfect place to forget about the outside world and reconnect with nature. The Gilded Iguana takes the traditional beach experience and steps up the game. This is a Costa Rica hotel dedicated to enjoying nature and preserving the relaxed, uncluttered surfer lifestyle with guaranteed comfort and beauty. In fact, upon checking in, you are given two keys: one for your room and one for your surfboard locker. Both public areas and rooms bring up the colors of the blue ocean outside along the smooth textures of wood, sand, and water. The hotel was designed in a partnership with Benjamin Saxe, and everywhere artisan craftsmanship is showcased along decorations that evoke the beach outside. Rooms are modern, but relaxed and well-equipped, with terraces that allow the light and breeze inside. They are a good place to come to for some rest after a day at the beach. For the perfect escapade, rent a ‘beach pack’ and hit the sand with a trolley, beach chairs, and an umbrella ready for a day out. If you prefer to stay at the hotel there is plenty to enjoy as well. It has a main pool, a Jacuzzi, and a kids’ pool. The Gilded Iguana welcomes surf-loving families as well as couples and groups of friends. Guiones beach is only a five-minute walk away from The Gilded Iguana. Guiones is 7 kilometers of white sand and waves ideal for surfing. Whether you are a seasoned surfer or have just started practicing, The Gilded Iguana is more than happy to have you. Surf instructors at this hotel are certified by the International Surfing Association. They are capable of guiding and teaching surfers of all ages and skill levels. Join in the Surf School and Surf Club to enjoy days full of sun and ocean at the beach. There’s also a retail shop in case you need to back up on essentials, from sunscreen to surfboards. To slow down the rhythm for a while, The Gilded Iguana also has a spa for the wellness-oriented. First, meditate by the beach, practice some yoga to strengthen your muscles, and rebalance your mind and body. Then head to the spa for a massage or exfoliating treatment to rejuvenate your skin and bring some release to your back and legs. The spa also prides itself in only using Costa Rican sourced organic products. If you want to explore more of the area around Nosara, there’s an adventurous option as well. The coastline has hills dotted all along, making it a good spot for mountain biking. Guiones beach is also close to the Ostional Wildlife Refuge, so the jungle is verdant with jungle trees and animals. Ride up and down the mountain while spotting lizards, monkeys, armadillos and, of course, iguanas. The Gilded Iguana Restaurant and Bar is the biggest in the area. It offers a fusion menu of Mediterranean with Costa Rican flavors, and it’s open for all three meals of the day. Be sure to try their ‘casados,’ a traditional Costa Rican dish, as well as their Mojitos. There are vegan, vegetarian, and gluten-free options if you want to try them. If the little ones are coming along, they also have their own kids’ menu to taste. A long-standing tradition at The Gilded Iguana Restaurant is offering live music on Tuesdays. Be sure to attend for a variety of local musicians and perhaps even some dancing. With great food and surfing scenes, it’s easy to see why The Gilded Iguana has been a fundamental element for the last decades in Nosara. If your dream is to relax by a Costa Rican beach with lots of opportunities to practice surfing, this is the hotel for you. Simply contact us and we’ll gladly help with any questions you may have and get your Costa Rica Vacation planned by experts in no time!